Watch: With A Drink In His Hand, Salman Khan Dances Like No One Is Watching Him! [tps_footer]It was a special occasion for Salman Khan’s family on Sunday, as their sweetheart Arpita Khan Sharma is going to be mommy soon. Bollywood stars Elli Avram, Sangeeta Bijlani, Anushka Sharma and many others attended Arpita’s baby shower on February 14. Being a doting brother, Salman Khan left no stone unturned to make his little sister Arpita Khan Sharma’s baby shower party grand and memorable. From decoration, to yummy food, every small thing was precisely organized. It was quiet a star-studded event as many stars from the film fraternity including Kabir Khan, Ritesih Deshmukh, Genelia D’Souza, Shilpa Shetty were seen at Arpita’s baby shower. Being a doting brother, Salman Khan didn’t leave a chance to make the party more entertaining. The actor was seen dancing his heart out with other guests like never before. 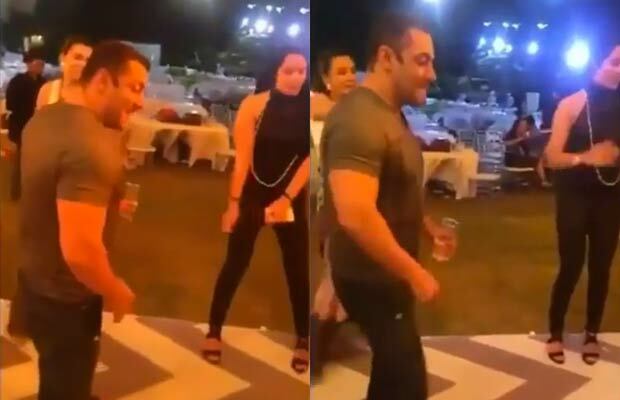 The pictures of Arpita’s baby shower party showed that the stars had a gala time, but the recent video of Salman dancing is surely a must watch. We got our hands on the video where Salman Khan is seen dancing his heart out on songs like ‘O O Jaane Jaana’, ‘Sooraj Ki Baahon Mein’. Previous articleAirport Diaries: Sonam Kapoor, Sooraj Pancholi, Surveen Chawla And Others Spotted! Next articleJacqueline Fernandez’ Heart Still Beats For Her Ex, The Prince Of Bahrain?